An axe-wielding maniac stalks four friends caught in a remote winter cabin. At the scene of a car accident in the snow, an axe-wielding masked man murders the lone bloody survivor. Musician Winona travels snow-covered roads towards a house rented for her by her manager. He feels that two weeks in her hometown will be good for her. Unable to see the landmarks clearly because of the weather, Winona pulls up to the house she thinks is for her and begins to make herself at home. Winona drives to the local Dart Club for a drink. Winona’s ex-boyfriend Rick happens to be at the same bar with his friend Carl and Carl’s girlfriend Liz. Rick and Winona end up in conversation. Winona invites everyone to her cabin so she does not have to be alone. Fleeting glimpses of a shadowy figure are occasionally seen inside and outside the house. The following morning, Carl discovers that their vehicle has been sabotaged. Shortly thereafter, he enters a darkened room in the house and is attacked. Liz goes looking for her boyfriend and is also killed by the masked man. Rick goes outside and follows a blood trail in the snow to a shed. Inside, the masked man is eating Liz’s body. Rick picks up the axe and puts it in the killer’s back, but the man is unfazed. The killer chases Rick back to the house and throws the axe at Rick. Rick falls off the steps and injures his leg. The killer then finds Rick and decapitates him with the axe. Winona finds Liz’s blood in the living room and cleans it up. Snow falls off the sign in the driveway and reveals that Winona is not in the house intended for her. Through the window, Winona later sees the killer pointing at her as he comes towards the house with an axe. While hiding, she receives a text from her manager cluing her in to the fact that she is in the wrong place. As she plays cat and mouse with the killer, she discovers the grisly remains of the other houseguests. Eventually, Winona makes her way to an underground cavern with an ice floor where she finds a torn open body. Winona returns to the house and is forced to fight the killer again. Winona’s manager arrives and shoots the killer, but the masked man is still able to kill the manager with his axe. Winona runs to the car but it does not start. She returns to the house to retrieve the manager’s car keys from his body, but the killer bites off two of her fingers and captures Winona. Winona regains consciousness inside the killer’s lair, where she is hanging upside down. She and the killer eventually enter a protracted struggle and Winona is finally able to kill him with an automatic weapon. She then takes the axe to the chains on the door and escapes. Two couples spending the night in a snow covered remote cottage wake to find themselves stalked by an axe-wielding masked killer. 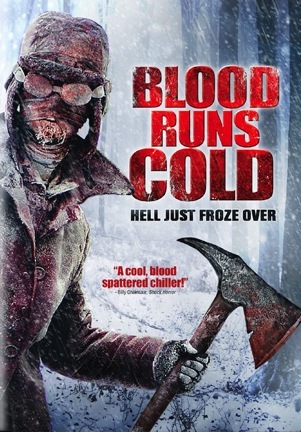 That one sentence is everything there is to the story of “Blood Runs Cold” and the film makes no apologies for that fact. “Blood Runs Cold” strips away plot, depth, and originality to use the minimum frame possible for delivering scenes of an axe ripping through human flesh. Nothing more. Nothing less. Everything in the preceding paragraph is all the foreknowledge required to determine what personal value might await in the film. Looking for a mindless 80 minutes of formulaic hack and slash? There is nothing wrong with that preference, if visceral thrills are all that is desired. And “Blood Runs Cold” has that covered. But seen too many 1980’s slasher retreads that lack creativity or entertainment value beyond a few gory kills? Move along. There is definitely nothing to see here. Every once in a while, depending on mood, a straightforward slasher can be a fun experience as long as proper expectations are tailored beforehand. But if a minimalist horror film is only going to do as little as possible to constitute a feature release, then it really should be close to perfect in those few things that it does. And that is a bill that “Blood Runs Cold” does not fit. Who takes the time to clean up the blood in a horror movie? The characters are so thin as to almost be made out of mist. Of the traits that the scriptwriters managed to inject, brainpower was not among them. The Final Girl of “Blood Runs Cold” makes some of the daftest choices ever seen by such a character in a horror film. When she wakes up in the morning to find that her other three houseguests are inexplicably missing, and there is a gory blood puddle staining the living room floor, what does she do? She fills a bucket with soapy water, grabs a brush, and starts scrubbing the floor. All evidence points to something mysteriously gruesome going on and her worry is over losing the security deposit. Later, Final Girl tries barring the door between her and the killer by fastening a tiny hook latch into an even tinier eyelet. This is the type of lock usually seen on the screen door of a country porch. It would not stand up to a gentle breeze let alone a homicidal maniac, yet here she is banking on its sturdiness for her survival. Seriously? This "lock" is supposed to stop the killer? “Blood Runs Cold” also confirms that an axe is a really poor choice of murder weapon for a serial slasher, especially if scrappy female or physically fit athletic types are on the victim list. This goes for the entire genre, but it most certainly applies to this movie. If there were a way to tangibly measure axe swings that connect with flesh versus axe swings that lodge into walls, floors, doors, or furniture, the scale would tip right over in favor of the latter. Adding to the hilarity is when that axe wielder violently tears up his own home while maddeningly lobbing blade arcs at his target, which is something that also happens here. On the plus side, the killer of “Blood Runs Cold” does have a unique look. A burly parka speckled with frozen snow, frosted goggles, and bloody fabric across the face aptly reflects his menace. Yet while he is suited for winter, the script surprisingly is not. The remote cottage setting is covered in snow, but the winter aspect of the story does not play a huge role. While there is the occasional depiction of cold breath, snowdrifts do not strand anyone and no one is ever at risk for frostbite or hypothermia. It is a wasted opportunity to take full advantage of the wintry look and feel, but “Blood Runs Cold” is full of such spots where the simple and straightforward road was taken instead. Some might be forgiving of the film because of its low budget and its specific intention to not be anything more than a simple bloodbath. But aiming the bar low and hitting it is not what makes a good movie. Or even an entertaining one. “Blood Runs Cold” is just a frame to showcase a few bloody kills while one maniac chases around interchangeable victims. That is all this movie is. And for better or for worse, that is all that “Blood Runs Cold” wants to be. June 27, 2013 by Ian Sedensky.